JPS, 20th century C.E., JTS, TaNaKh, English Translation, targum, 57th century A.M. The 1985 JPS may be on the Amazon best seller list but it won’t be until 2080 before its contents enter the Public Domain. 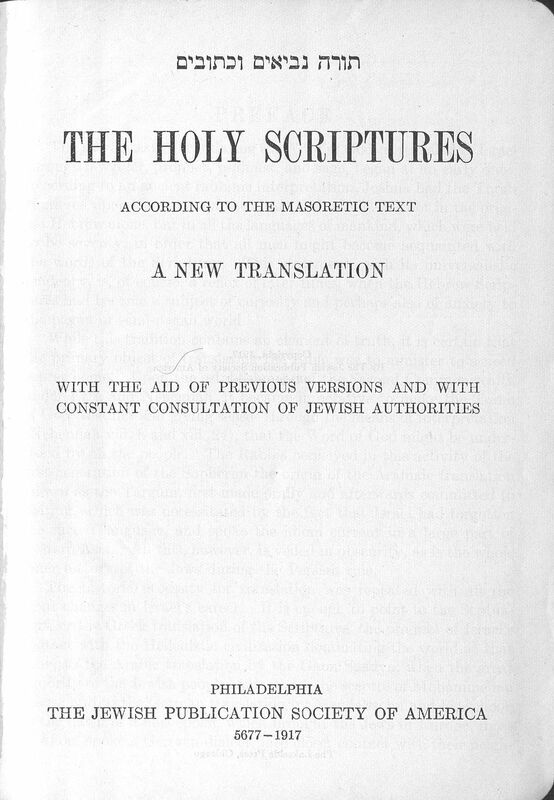 Thankfully an excellent English translation of the TaNaKh already exists that we can use, modify, and importantly, update: The Holy Scriptures According to the Masoretic Text: A New Translation with the Aid of Previous Versions and with Constant Consultation of Jewish Authorities by the Jewish Publication Society of America (aka, the 1917 JPS). Max Margolis led the committee of scholar/translators which included Cyrus Adler, Solomon Schechter, Kaufmann Kohler, Samuel Schulman, Joseph Jacobs, and David Philipson. (Begun in 1890, Schechter and Jacobs died before the translation was completed in 1915.) Once published, it effectively became the standard Jewish translation for most of the 20th century. The 1917 JPS is an accurate translation, but is considered archaic by contemporary translation standards. 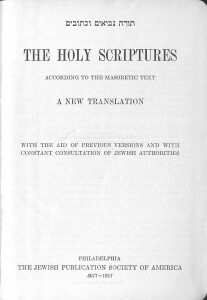 Margolis, a non-native speaker of English, felt that was the proper standard of language that Jews should adopt for their translation, and so the literary form of the 1917 JPS was consciously based on that of the King James Version. The 1917 JPS translation was used in the Pentateuch and Haftaroth edited by R’ J. H. Hertz and in the Soncino Books of the Bible series. With the text available, the 1917 JPS could form an excellent platform for deriving more modern translations. As such, it can be the basis of one or more new, freely redistributable Hebrew Bible translations. A free text for creating derivative works, however, has not been available was not available until 2010 when JPS Publications began offering the tome as a free PDF download. We are grateful to JPS for contributing an authoritative digital edition of the 1917 JPS to the Public Domain, and for this statement of support. The Jewish Publication Society supports the Open Siddur Project’s efforts to remix the 1917 JPS English translation of the TaNaKh, thereby adding value to an important historical work produced by JPS which has entered into the Public Domain. It is such good news that JPS is finally distributing their own free digital edition of the work. Until recently, there was really only one other extant digital edition of the 1917 JPS — and a separate copyright was claimed on that edition by its transcriber. That edition can be accessed at some sites on the Internet (see here and here). The distributor of that edition claims that certain changes they made to the Public Domain work constitute creative work that is protected by copyright. Furthermore, they state they are under no obligation to show exactly what changes they made to it. Wikisource, ran afoul of this copyright claim in 2008 when they began redistributing text from that edition and received a warning. In response, the Internet Archive at archive.org made their own free edition but the quality of its transcription was exceptionally poor. 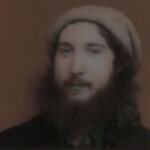 John B. Hare, z”l, founder of the Internet Sacred Texts Archive, determined the best course of action would be to simply comprehensively re-transcribe the work with a Public Domain declaration. The work he managed to completed before he passed away is available here. The lack of a free, high-quality digital edition of the 1917 JPS led to the Open Siddur Project collaborating with the Internet Sacred Text Archive to transcribe our own free and unrestricted edition of the work. That transcription effort can now end and move to the next stage, because thanks to JPS, the text of the 1917 JPS is available for encoding in a standard XML format (JLPTEI). As an authoritative Jewish translation, it can serve as an important translation source for much of the Siddur. Hare provided us with full page images of the 1917 JPS. We have generated a first-pass transcription produced by computer using Optical Character Recognition (OCR) technology. With the digital edition provided by JPS, our jobs now remains to follow a few simple transcription conventions that will make it easier to convert the text to web-viewable format. Our resulting XML formatted text will be licensed with the Creative Commons Zero (CC0) Public Domain declaration. The more volunteers who step up to work on this, the faster we’ll finish. To help us, please start here, and don’t hesitate to ask any questions. The full scan of 1917 JPS is here. Our scans are licensed Creative Commons Zero (CC0), a Public Domain declaration. Once encoded in JLPTEI XML, the work will be available to reference and download from our public database. Check back on this page for news on our progress completing an XML formatted edition of the 1917 JPS. “תנ״ך | TaNaKh: the Holy Scriptures: A New Translation (JPS 1917)” is shared by the Hierophant with a Creative Commons Public Domain Dedication 1.0 Universal license. 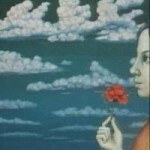 2011-03-18 – 13 Adar II 5771 at 9:23 am · Reply. At the category page I put a notice that a project to type, proofread, and revise this translation is going on here. It would be appropriate to put a description of this current project at the proper page at English Wikisource where the project began. 2011-03-18 – 13 Adar II 5771 at 2:18 pm · Reply. I also made an edit over at the Wikimedia Commons page. The folks at Wikisource working on this should know about this because right now, we have pretty much as close to an authoritative source of the JPS 1917 as possible available in Unicode plaintext with a Public Domain dedication. No one should be wasting any time transcribing (or OCR’ing) this text anymore. Folk can proofread the text if they like, but attention needs to be given to other important work with the JPS 1917. One idea should be comparing this text against Nelson’s to identify whether there was any copyfraud in his making a copyright claim on a work in the Public Domain. If that can be proven, we can expect to see some consequences to how it is being used elsewhere on the web right now. 2013-07-23 – 16 Av 5773 at 6:41 am · Reply. I am teaching a class on Bereshit in the fall and wanted to distribute the audio and some commentary and do not want to deal with permissions and verse counting, etc. I searched for a public domain translation that had a Jewish basis and came up empty handed. So, I have started creating my own modernized version of the text based on the 1917 JPS. I am not retranslating, just editing the 1917 JPS version to remove some of the archaic language and consulting the original Hebrew to make certain that I don’t go to far afield in my edits. The main goal is to produce a readable, reasonably accurate translation, to use in class. It is important that it does not make me feel like I am at the renaissance fair whilst reading it. I am using the TXT file on this page as my starting point. My plan is to release the whole book of Bereshit under the creative commons (or similar) license. 1. Is there interest in this? if so, I may continue on to other books and works I use in my class. I do an entire class on the Genesis through Kings Narrative, so it would be quite an undertaking – but working through every line of the text is giving me quite an intimate experience with it, so I think the work may be worth it. 2013-07-23 – 16 Av 5773 at 9:07 am · Reply. What you are working on is quite important but you may benefit from collaborating with others. We recommend your working together with the Sefaria Project, which uses the 1917 JPS as their base for translation. 2013-07-24 – 17 Av 5773 at 7:27 am · Reply. Thanks for the link, this is a good site and could be very helpful. 2015-06-07 – 21 Sivan 5775 at 9:19 pm · Reply. also, do we have any update on JLPTEI XML encoding of the JPS 1917? Thanks! 2018-08-19 – 9 Elul 5778 at 1:38 pm · Reply. Songs 8:14 Make haste, my beloved, And be thou like to a gazelle or to a young hart Upon the mountains of spices. 2018-08-19 – 9 Elul 5778 at 3:04 pm · Reply. Good catch. I’ll look into this. I’m fairly certain this issue is resolved over at sefaria.org which initially adopted this translation, but take a look. 2015-02-20 – 2 Adar 5775 at 4:23 pm · Reply.